From next April 21, 2015, changes the ranking of search results of Google from mobile devices. 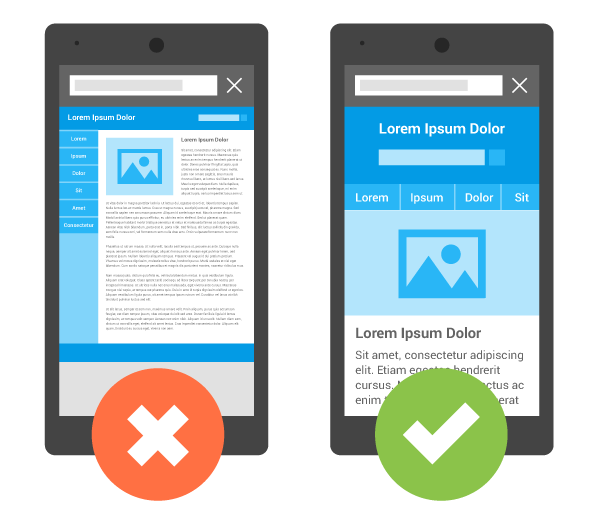 This policy reflects the idea that when it comes to mobile search, the user should get more relevant results, showing websites preferably adapted for display on the mobile device from which the search is done. In view of the growing number of mobile users, Google has decided to change its algorithm to adapt to this new usage pattern. This change will affect mobile searches worldwide in all languages and will have a significant impact on search results. Therefore, logically, websites adapted to mobile devices are, today, a necessity. Want to know if your company website is adapted to mobile? A few years ago, and in relation to the Internet, the goal of any company was to have its own website. Today, the sector has developed exponentially, so there are many other ways of being in the Internet. 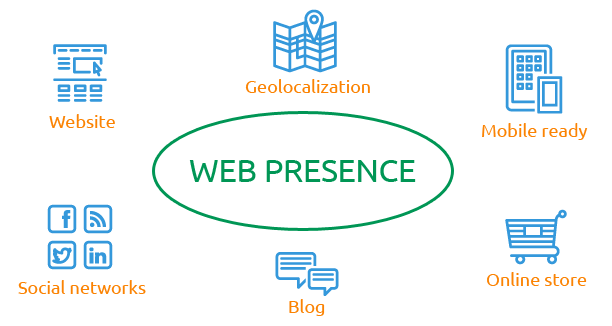 That’s the reason because today we talk about “web presence” more than “website“. The difference between the two concepts is that the website is one of the elements or spaces that make up our web presence. Analysis of the types of web sites that I can have. Analysis of the profiles of the company, the products, the services and the customers. Analysis of the use that can make each web space to present my company, its products or services, provide customer service, etc..
Website . It is our corporate site par excellence, where we provide the most comprehensive information about who we are, our philosophy, what products or services we have available, etc..
Online store. Is where the user acquires our products or services. Blog . We use it to provide knowledge to the industry in which we operate. Tools- mobile applications. All spaces and actions we take must be ready for mobile devices. Email (direct marketing). Use your web sites to collect information from people interested in our products or services. Then send them information by email that may supplement by visiting our web site or online store. We must to sit down for a while and make ourself the following questions: What type of business do I have? What field within Internet is good for my business? What types of products or services do I offer? What field within Internet is good for it? How is my current client and potential? Where are my clients within Internet? In the online store we sell, obviously. 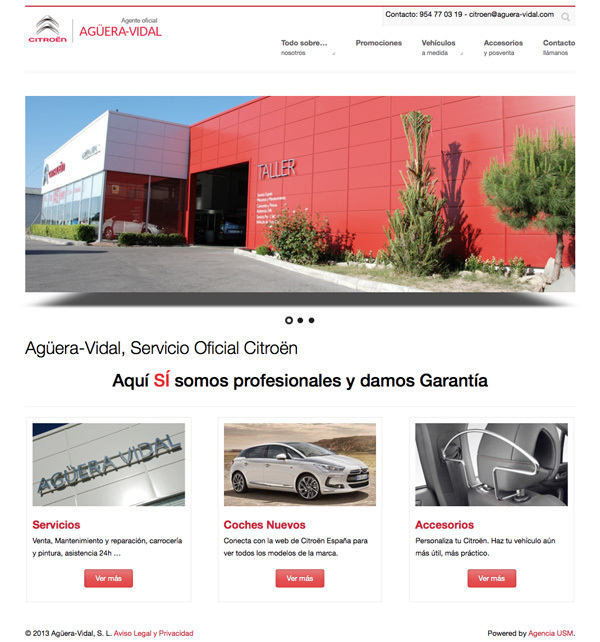 In the corporate website we tell all about us; showing to the customer the confidence he need. In social networks we can show our projects, or even give customer support… We can make a specific use of each space. Once we have analyzed the above factors, we can design a strategy and communication plan to create or enhance our web presence, which means to be as visible as we can. Only if people see us, hear us or recommend us, they can be interested in us. Regarding how to design a website, as explained in the previous article, it is important to provide accurate and clear information of who we are and what we do. Users will appreciate that we do not waste time. In addition, a clear, direct and brief message will generate confidence in users. Other factors such as the successful combination of colors or good pictures, generate sense of security in users. KISS rule. Keep It Stupidly Simple. Don’t complicate the design with structures that disallow understand the message. A good habit is to put the elements (text, pictures …) one on top of other. This will allow also view properly the content on mobile devices. Responsive. 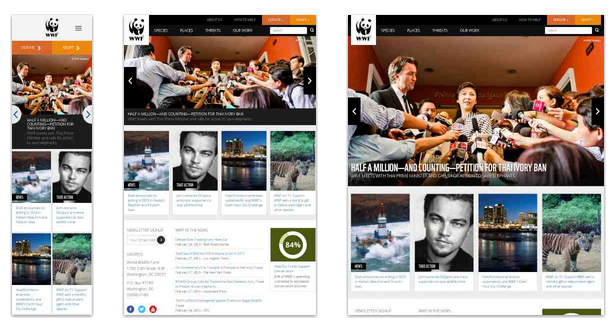 This a kind of structure in which styles, templates or themes can suit different devices from which the website is displayed: computer, mobile phone or tablet. Choose a theme or template and follow the developer’s instructions. If we choose a CMS (WordPress, Joomla, Drupal…) for the development of our website, we will apply a design template, that we have to acquire in the CMS market, either paid or free. It is worth spending the time necessary at this stage of development of the site and to choose the template or theme that best suits our company, product / service and client. Usually developers provide complete documentation on installing and configuring the template, along with tutorials to profit all the potential of the design. The power of image. Choose high quality photo images and large original size, because that will allow us to use more options. A good image is capable by itself to convey powerful messages. Attention to details. Be curious in choosing images, menu, typefaces, colors, buttons, horizontal lines and other content separators, etc. Always improving. Always improving. Once the design is complete and website is published, we are going to let it work for a while and then let’s do it evolve. The usage will say us how to improve it. In short, do a fine job, take the time to make an attractive website that invites to be visited. And don’t forget that is the showcase of your business. Great! We already have our domain name and hired a hosting plan. So we can begin to design a website. On this occasion we will refer to a corporate website, that is, a website where we will show who we are and what we do. Who we are. Here we reflect our business philosophy, our character, our understanding of business and customer relationships. Our products or services. It will detail what we offer to the market, always in a clear way, especially if the product or service is complicated to understand. Why us. Here we will show our value added, the reasons why a potential customer could buy or hire our services. This may be on a separate page or as an idea broadly reflected throughout the website. In general terms, each server has an (or various) ID, which is known as IP. When you register a domain name, you have to configure it to redirect that domain to the IP of our server, which is where you find the folder that stores the website. There are many types of web hosting, from small spaces for a simple website, to special plans designed for large content portals. The hosting plans are becoming more advanced and offer more services: plenty of space, email accounts, databases, backups … If you need to hire a hosting plan, my recommendation is to contact one or more companies providing this service. Tell them what kind of website you need to host and what other services you’ll need (e.mail accounts, databases, etc..). Generally, the hosting company also provide domain registration. Another option is look for advise from a good web designer. He’ll know much better about the web hosting industry. He will recomend a good hosting company and, within it, the plan that best suits your needs. We know what we need, as a minimum, to have a presence on the Internet: a domain name (www.agenciausm.com, for example), the website itself (static website, dynamic and customer upgradeable, online store …) and finally , the hosting (we booked space on a server to store there our website and have it always available. agenciausm – Domain that corresponds to our name. 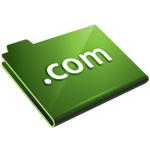 .com – Suffix or TLD. It is a good idea if the domain name is descriptive on what it represents. If we are carpenter, and our carpentry is called “The Tree”, better to choose “thetreeparpentry”. It could include a more descriptive element, corresponding to the geographic location of the business. If we are in Boston, we may use “thetreeparpentryboston”. In any case, we try to keep something simple and not too long. Also useful that the suffix provide information on the type of business or organization that represents, as well as its geographical location. There are different types of suffixes. Some indicate Nationality (US, CA, ES…); some others indicate the type of business or entity (COM, NET, ORG, MOBI…), etc.. The most popular suffix is COM. Sometimes we prefer to highlight the international profile of the company, so we would use the “COM”. Others, we prefer that the online business image is strongly linked to their nationality. In that case, if our business is canadian, we use the “CA” TLD. Which are the minimum requirements for doing online business? Most entrepreneurs know that today you have to be on the Internet, but not know the minimum requirements for doing online business. An excellent way to start is through a corporate website. In her show who we are, what we do, how we work and where we are: the essentials for anyone to know our company. The last part of the name (.com) refers to the type of business or the geographical area. “.Com” for commerce companies, even international; “Net” for Internet-related companies; “US” for northamerican entities; “Org” for NGOs, etc..
Is the design and construction of the website. There are many tools available to develop a website. 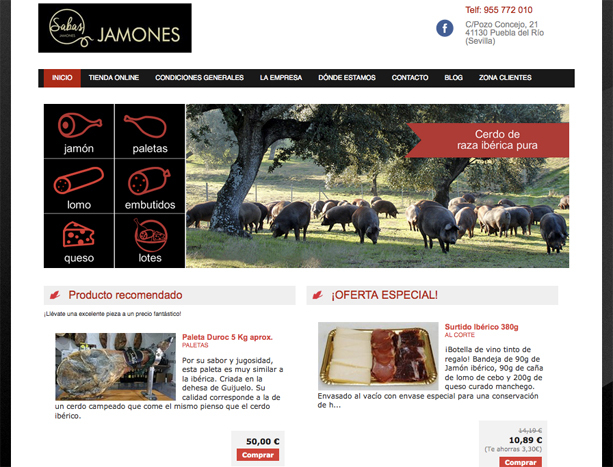 The important thing is that the website meets our needs and those of the client. A website is composed of a set of pages. All web pages and images that appear in them are contained and organized in a folder with their subfolders. This folder must be stored in a kind of computer, called a server, so that when we write the address in the browser (www.agenciausm.com) can be found and show the content to the visitor.